BBQ sliders, beans, slaw, and a handshake from a Pirates great. PNC Park Food Options, #1) Manny’s BBQ Platters. Longtime Bucs fans of course remember Manny Sanguillen, the star catcher of the great 1970s Pirates teams. Today Manny sits behind the counter and signs autographs for people patronizing his BBQ stand, like Boog Powell does in Baltimore. Manny’s is located in the Riverwalk area in center field. Their burgers are grilled on smokers in full view behind the counter and across the aisle. You’ll love the smell. Loaded burgers especially get good reviews, and the platters with beans and slaw offer decent bang for your ballpark buck. Anyone want my extra pierogi? 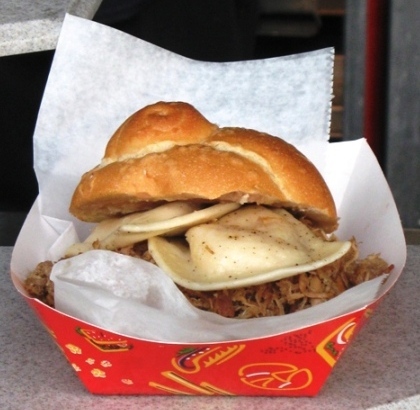 PNC Park Food Options, #2) The Pulled Pork Pierogi Stacker. Manny’s (and the Familee BBQ stand in Pops Plaza) is also home to the Pierogi Stacker, which was pulled pork with onion relish, barbecue sauce and pierogies—yes, pierogies—piled on it and sandwiched between two soft pretzel rolls. It’s vintage Pittsburgh. Such a sandwich would probably require a fork and napkins to eat, and it’s probably not the healthiest thing, but who cares. At least you’re not likely to be hungry afterward. Well worth the sugar crash afterward. 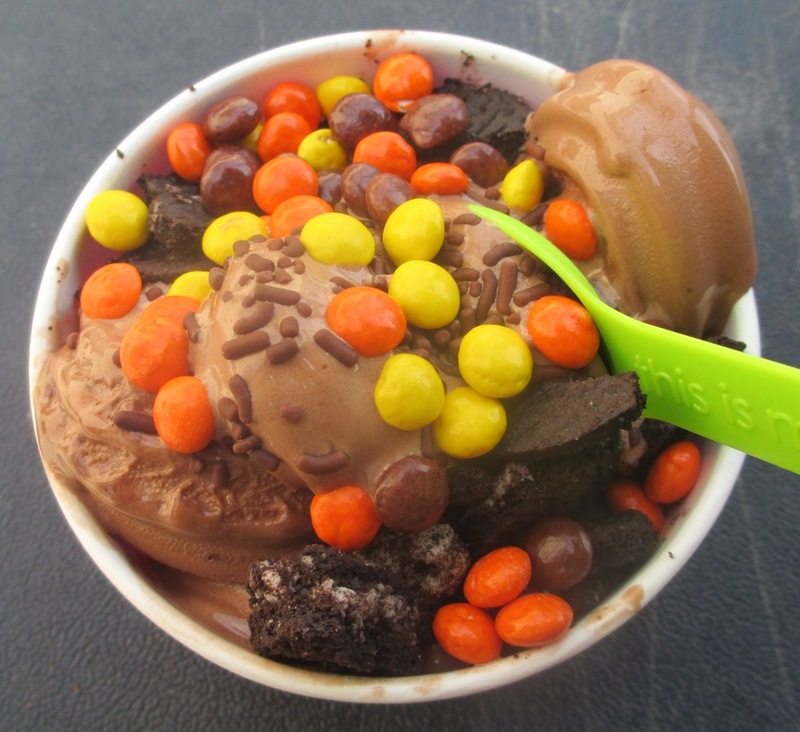 PNC Park Food Options, #3) Menchie’s Frozen Yogurt. Menchie’s frozen yogurt is pretty popular; the chain has locations all over the world. 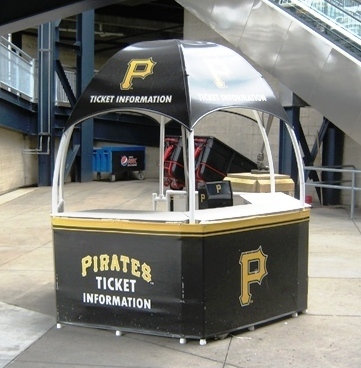 And one in PNC Park. The PNC outpost almost looks like you can help yourself (but no, it’s not free); pick a cone or a cup, fill it with vanilla or chocolate yogurt and then top it with a great selection of toppings including Reese’s pieces and crushed Oreos. This is probably the fanciest dessert item outside of the Club areas; and the yogurt is kosher and gluten-free as they point out. I’ve tried Menchie’s and it’s awesome, especially for the price…highly recommended for dessert at PNC.